and at least one infamous execution, of the king’s secretary; the why and the who-ordered-it are still the subject of debate among historians. 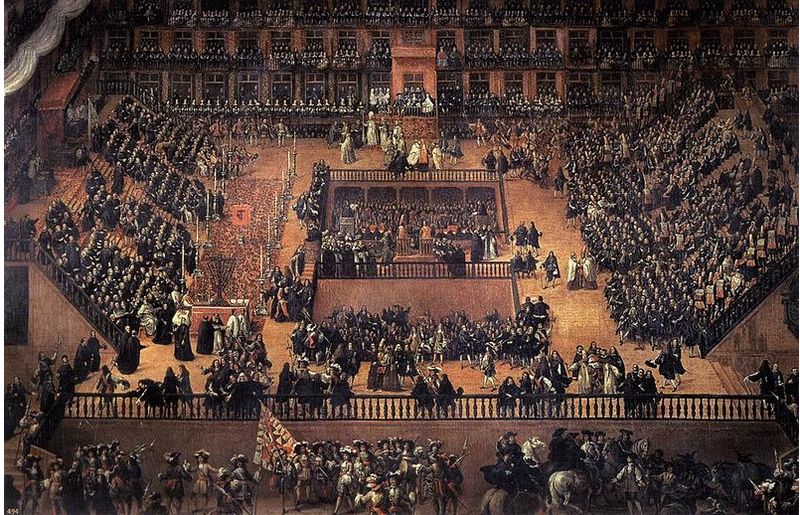 The largest celebration was apparently the welcome given to Carlos III on his arrival from Italy where he had been serving as regent there in the Spanish dominions in the boot. He was a king who actually did things for the people, like build them schools. Unheard of! Who could have imagined this? Must have been something conjured up by Don Quixote himself. I wonder how long he lasted. 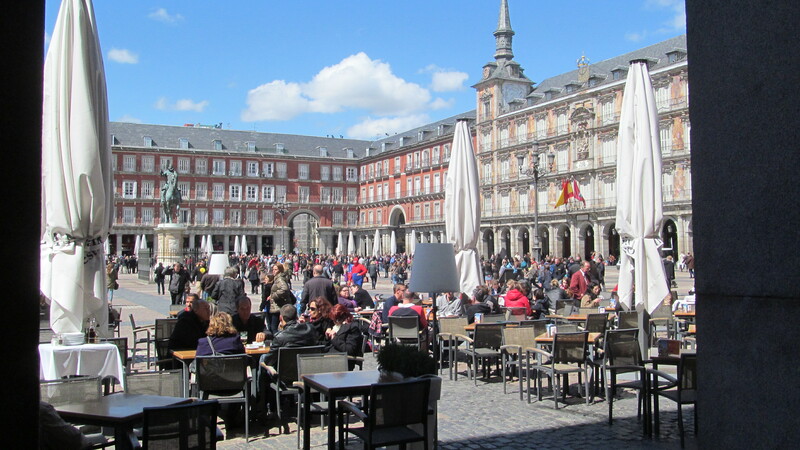 Today the plaza is a gathering point for Madrileños and Madrileñas. Their great pastime is strolling in their finest through the streets of the city on a Sunday afternoon, enjoying a leisurely lunch or glass of wine in one of the many outdoor cafés. The building on your right has an extraordinary facade. 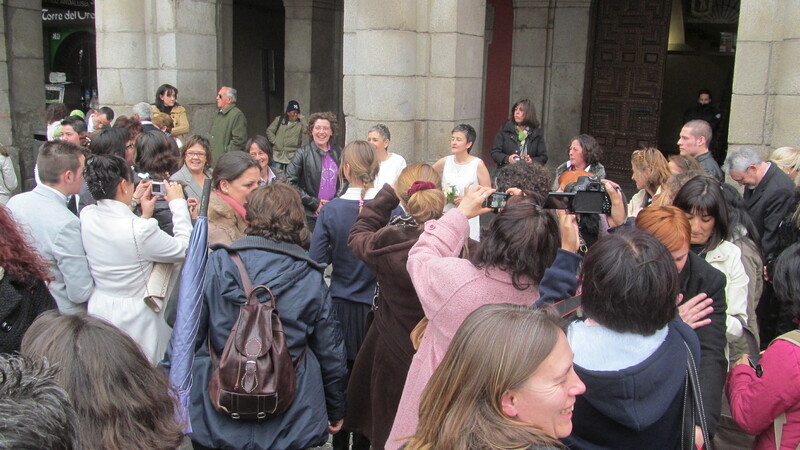 The registry office is nearby and today a lesbian couple were celebrating their wedding, legal in Spain for quite a few years now, surround by friends and family. On Sundays, the periphery is the scene of flea market. The square is only a few blocks from the Rastro flea market, a Sunday event which takes over a whole neighbourhood of narrow streets in the area known as La Latina. Here we see a vendor of old books. Behind is a shop that specializes in making hats (gorras), including military ones, a shop which will have occupied this location for many a generation. 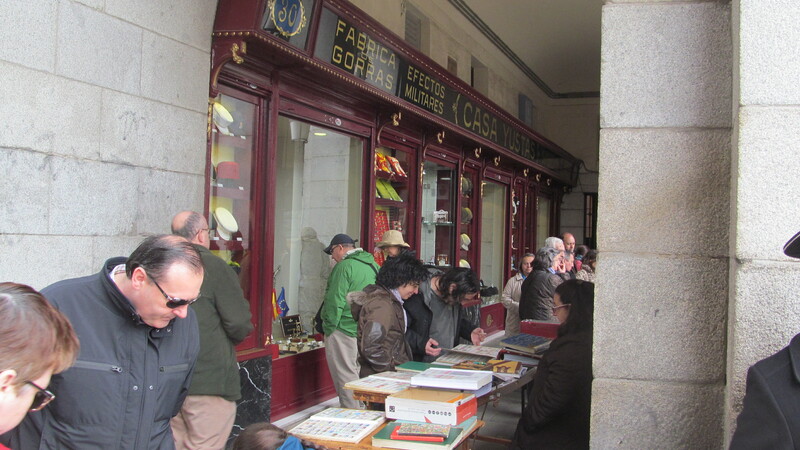 In the other direction were stamp sellers; in the narrow passageway leading away from the square are found a half dozen small stamp and coin shops. Like antique shops, they tend to congregate. 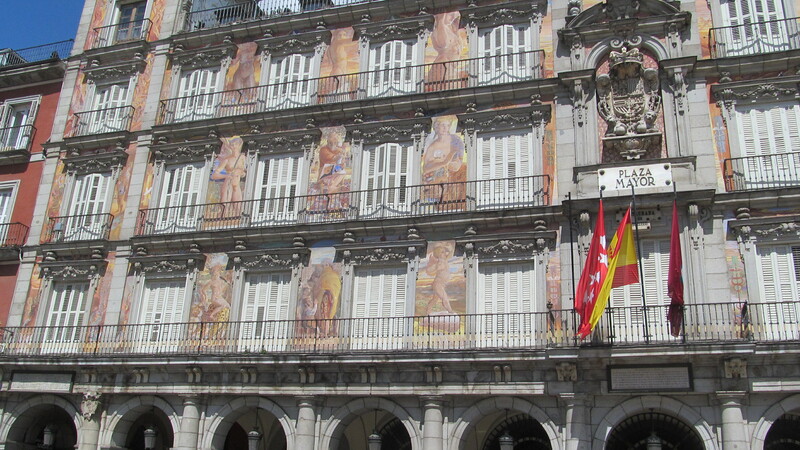 But a place like the Plaza Mayor will have always attracted entertainers, theatre troupes and solo performers, along with the hawkers of wares of all kinds and probably, most likely, pickpockets. 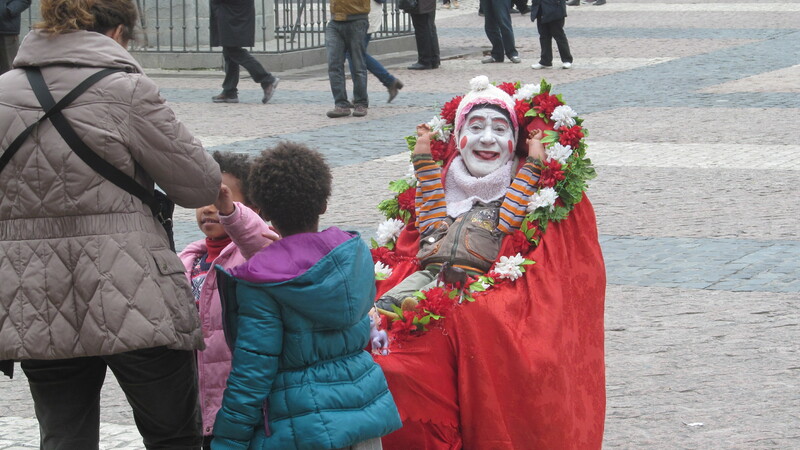 And today is no exception; they range from a wide variety of costumed ones looking to make a euro from tourists who want their photo taken with a matador, a flamenco dancer, or even an outrageously over-the-top and portly Spiderman. Hopefully I will have a video of him in action for another post when I return here at the end of April. 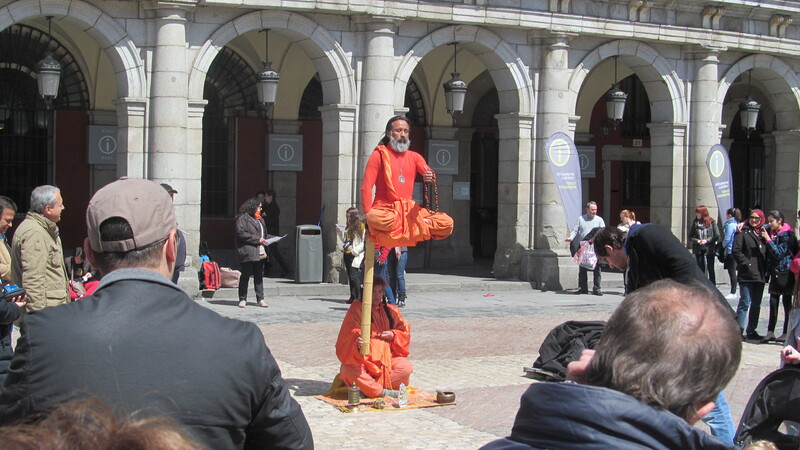 I present to you a swami being held up by his companion sitting on the ground holding a piece of thick bamboo on which the said swami is sitting. I will get a better photo for that later post. 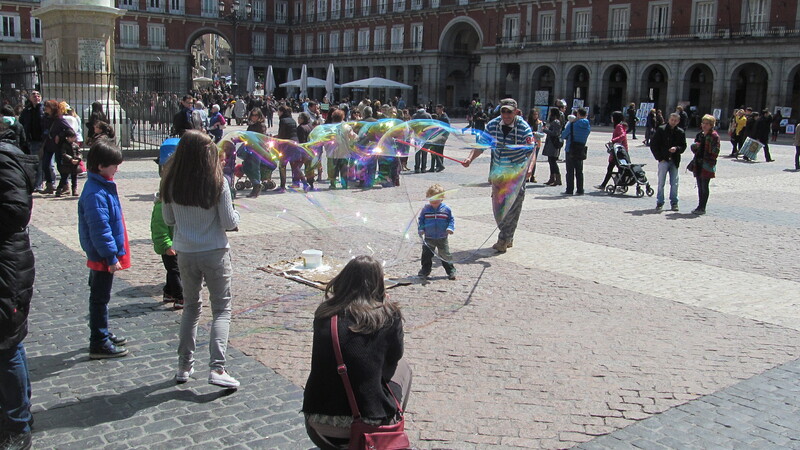 A man with a bucket of the right kind of soapy water creating amazing bubbles to the delight of the children. He was so tender with the little lad who at first was quite unsure of what was happening. I went back the next day to take a video; the actor was much younger, but still a delightful performance, delighting children of all ages. The mud fight in Post #18 took place in the plaza mayor of this village of 700. Every city and village has its plaza mayor, the site of the important events in the life of the pueblo. In a couple of days I will be getting together for dinner with a friend, Montse, in her city of Valladolid, a few hours north of Madrid. I have never been there. Where will we meet? In the Plaza Mayor, to be sure, seguramente. This entry was posted in Uncategorized on April 7, 2013 by agnotarte.